Should we Read the Jo Nesbo Books in Order? Reading the Jo Nesbø books in order in English means that we can now finally catch up to all 11 Harry Hole novels (they have finally all been translated to English), the 4 Doctor Proktor kids series, and the author’s four standalone novels. I am really glad that most of his work has been translated, and hopefully, as the Harry Hole series grows, the books will all get the English update as well. Here are the Jo Nesbo books in order for his two main thriller series and standalone novels. The Harry Hole novels are listed by the original name, publication order, chronological reading order and the English date of translation for each book. As most of the books are also part of the so-called Oslo Sequence or Oslo series, I have included in brackets their order as well (they are all part of Harry Hole books). Many of us have read the books out of order because that’s how that’s the order in which they were translated to English. Now, however, you’ve got the chance to read them in proper chronological order, and if I had to do it again, I’d read them this way as well. The stories/cases are different, and if you read them randomly it’s not a big deal, but you will get much more out of the books if you start reading them with The Bat and working your way up the list. By the time you finish the books, there might be another one just ready and translated for us. Jo Nesbø (website) is a Norwegian author best known for his Harry Hole mystery series. Born in 1960 in Molde, where he also grew up, he attended the Norwegian School of Economics from where he got his degree of Economics and Business Administration. While he grew up in a family of readers, his first passion in life lied elsewhere: he wanted to become a professional football (soccer) player. However, his dream, along with his cruciate ligaments, got shattered at the age of 18. He could no longer play football, so he had to look elsewhere to continue his life. Because of soccer, his grade suffered, so when he finished school, several career paths were closed off to him. So he instead enrolled in the army spending his next three years not only learning to fight but also learning self-discipline and the high school curriculum. After the daily exercises, he would spend his nights studying. When he eventually got his high school diploma, it was a piece of paper he could be mightily proud of: his grades were excellent. Sometimes when suddenly many doors open up in front of you, the choices are overwhelming and you can choose to go through the wrong door. This is what Jo experienced as well. He was not sure of the career path he wanted to follow, so he enrolled in a prestigious school with a long, established tradition in Bergen. But when you are not fully committed to the path in front of you, distractions will happen. While still studying, he became part of a band of rock musicians called De Tusen Hjem. He was the band’s guitarist. After graduating from the university with a diploma in BA, he moved to Oslo where he started working in the finance field as a stockbroker, writing songs by the side. Someone heard his compositions and offered him the opportunity to start a new band together. The band they created was called Di Derre and it turned out to become quite popular in Norway. Working a regular job during the day, Jo Nesbo was playing during the night. He would not commit to ditching his daytime job because it was one thing to play as a part-time hobby, and another to fully commit to it, which might mean becoming burned out. And eventually he got burned out by everything in his life, so he decided to take a sabbatical and moved for a while to Australia. While on the plane, he started working on his very first novel, which would become his first Harry Hole book as well. When he returned from Australia, the book was almost done. After he finished writing it, he sent it to a publisher under a pseudonym, since his name was pretty well known in Norway. The first Jo Nesbo book was published in 1997 under the name The Bat. It soon won two awards, the 1997 Riverton Prize for Best Norwegian Crime Novel and the 1997 Glass Key for Best Nordic Crime Novel. In 1998 Jo moved to Bangkok for a while, where he worked on his second novel called Cockroaches. And so a new famous novel star, Harry Hole, was born. The story is still set in Scotland, as per the original Shakespeare, but the time setting is different. 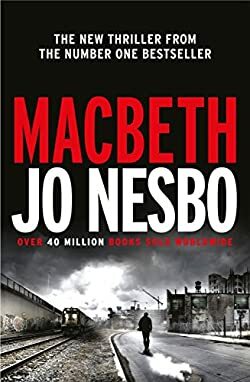 The Jo Nesbo Macbeth novel is set in the early 1970s instead of the 11th Century. I am reading The Stalker by Lars Kepler. Pretty good…but love all of Nesbo’s books. If I had read The Bat first I doubt I would have read another of the authors books. It wasn’t until The Redbreast that I believe the author hit his stride. Since then I have been Hooked! however ” The Son” a fantastic read. looking forward to reading Blood on the Snow. Thanks for this helpful list. I’ve come across a problem with the Harry Hole series order, since I must listen to audio books. The man who reads Book 4 is difficult to listen to. Many reviewers on Amazon feel the same way. So I skipped “Nemisis” and went on to “The Devils’s Star.” At least I had some background from reading the first 3 books, and I thoroughly enjoyed “Star.” Robin Sachs, the usual reader is excellent! Also, those of us who borrow from libraries must wait for the next book in the series to become available. But this gives me an opportunity to listen to other greats like Henning Mankell’s “The Man from Beijing.” This was written after the Wallender series and is quite gripping. The book involves Chinese history, takes place in Sweden, China, Europe and the US and also involves Chinese-African relations. Fascinating! Hopefully, he’ll write more about the judge featured in this book. I think it’s a must to read them in order founder stand harry!